This page is a quick introduction to contemporary wall decals decorating guide since wall stickers or wall stick ons, as they are otherwise known, have made a come back in interior design recently. These self-adhesive vinyl stickers come in various designs such as flowers and animals, done in classy graphics and elegant colors. They are usually sold in a pack with enough decals to cover one wall in a range of prices, depending on size. 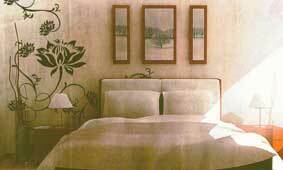 The stark graphic tree design on the window is illuminated by light streaming through (above) while the swirling floral designs on the wall compliments the modern oriental mood of the bedroom (below). 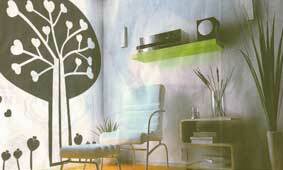 Unlike the 90s fad for wall stenciling or the recent trend in wall papering, wall decals create a new look in minutes. Just stick them on a wall, glass partition or even the toilet and voila! If you don’t like the effect, simply peel them off. The best part is, you don’t need help from a professional or an interior designer to put them up. The key to wall decals decorating guide is to decide on where you want the wall stickers to go on a wall, mark them out first if you’re unsure and then start sticking. They are great for rental homes where the wall has to remain undamaged throughout the lease period. The other advantage is that it allows you to customize your own décor while not breaking the bank. For best results, the wall should be clean and grease-free to allow the wall stick ons to adhere to the surface. They usually last at least 2 years and don’t leave a mark when you peel them off. This means you can change them quickly and easily when you tire of the design. However, most wall decals are not re-usable. Some home owners give this the thumbs up as they are a cheaper and faster alternative to mural art. Depending on the moods at home, decals come in a myriad of color, patterns and sizes. These range from modern oriental patterns, to psychedelic retro florals, to fun animal patterns for children’s room (see below). Besides walls, you can also stick them on windows and even toilet bowls for a splash of color. Take a look at wall decor ideas for more unique wall decor tips or click on highlighted text to return to the top of wall decals decorating guide.